This was a very poorly attested but clearly important state or confederation which lay immediately to the east of Elam in Iran, bordering it closely near Anshan. Its eastern borders are unknown, and even its exact location cannot be pinpointed specifically, although it is recorded as having been south of Gutium, which was in the central Zagros Mountain range. The archaeological site of Jiroft has been put forward as the polity's capital city. 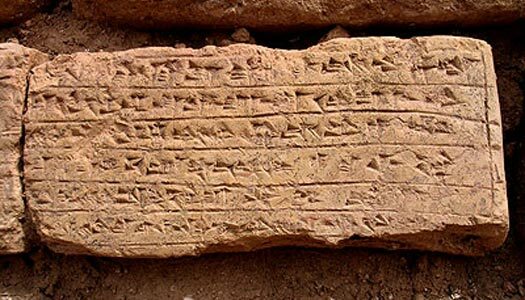 Its language was only very partially related to Elamite, but may have been in use as far east as the modern Iranian border, just west of Baluchistan. During the twenty-third century BC Marhashi (or Warahshe in earlier records) was a major opponent of the Akkadian empire, and seemed to have overrun Elam for a time, uniting local efforts against the Akkadians. In fact, it may have been the incessant military campaigns of Akkad which brought about the greater cohesion of Marhashi as a state as local rulers joined forces in a defensive reaction. Lugalannemundu of Adab extends Sumer's control to include territory from the Persian Gulf right up to the Mediterranean, bordering the Taurus mountains in the north, and the Zagros mountains in the east. Having subjected the Gutians, he confronts the king of the Marhashi, and leaves an inscription to record the event. Marhashi appears to become a dominant force east of Elam, but it is conquered by Sargon the Great of Akkad. Elam seems to remain tributary to Akkad for the subsequent century, so it seems likely that Marhashi does too. Together with Elam, Sidgau rebels against the overlordship of the Akkadian empire. Rimush re-conquers both states. Subsequently he tears 'the roots of Marhashi from the land of Elam'. Marhashi declares independence from Akkad along with Elam, although perhaps not immediately as it seems they are re-conquered for a time by Naram-Sin. Marhashi overruns Elam for a time, and unites eastern efforts in fighting against the Akkadian empire. A battle is fought near Akshak, at the confluence of the Diyala and Tigris rivers between the two states. One of the Marhashi ruler's daughters is married to Sharkalisharri of Agade or his son (Dudu? ), perhaps as a consequence of the battle, and as a sign of renewed ties of peace. In his twenty-sixth year, Shulgi of Ur attempts to forge an alliance between himself and Libanukshabash. He gives his daughter, Nialimmidashu, in marriage to the king. However, the alliance is short-lived, as Libanukshabash's successor causes Amar-Sin of Ur to launch a campaign against him. This is the last mention of the state in history. With the collapse of Sumerian civilisation in c.2004, record-keeping becomes fragmentary for a period of approximately two centuries. Elam fills the power vacuum in the east but records from that state are fragmentary at the best of times. By the time Mesopotamia has restored a level of cohesiveness, Marhashi has either ceased to exist as an entity, or is known by a different name.